If you have a disability or simply can’t walk the distance, a mobility scooter will help you regain your independence. There are various helpful vehicles available within our reviews so you are sure to find one that will suit your needs and of course taste in design too. Common terms used when referring to these helpful mobility vehicles are; disability scooter, power scooter, medical scooter and handicap scooter to name a few. A mobility scooter is a type of transportation built in order to provide people with permanent or temporary disabilities to get on with their day to day life. They are powered by a battery and an electric motor in order to give the user a smooth, quiet and environmental-friendly ride and to be used both indoors and outdoors. Kinda like the ordinary electric scooter but with a set of few extra wheels and more features. This makes grocery shopping, traveling, and daily errands once again easy tasks to accomplish. 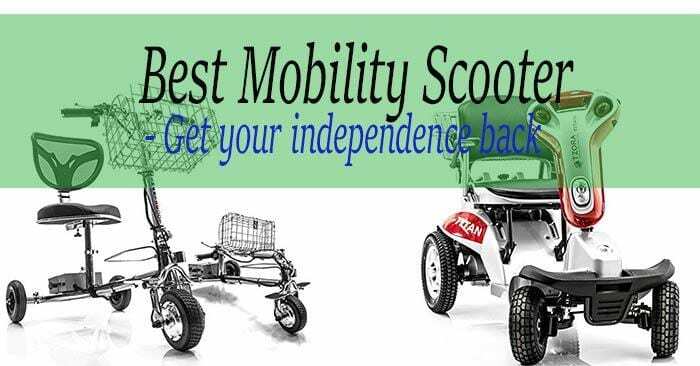 – Get your independence back with a mobility scooter. Beneath you can read a short review of all the mobility scooters we’ve tested in order to find the best mobility scooter. If you know what you are looking for, feel free to jump straight to that section using the content table at the top of this page. If you think these aren’t for you, well there are other types of ridables available. The buyers of a SmartScoot mobility scooter are those who want a lightweight, easy to use, yet powerful scooter with an easy assemble and disassemble process. They want one that fits into the trunk of even the smallest cars, in order to make transportation and travel, problem free. The SmartScoot folding electric travel scooter is a great travel companion. It’s lightweight, simple and yet robust. It gives a comfortable ride and gives you the feeling that you’re riding a bicycle again. SmartScoot travel is one of the best overall performing mobility scooters. It’s equipped with three wheels with good width between them for great stability and the vision Smartscoot had before making it shines right through. This is a simple, yet powerful scooter that can take you up to 12 miles on a single charge, at speeds of up to 7 mph it makes the Smartscoot one of the fastest mobility scooters on the market. With such a simple design you’d think comfort and features might be out of the picture but they aren’t. The chair itself doesn’t look like more than an office chair but it gives you great stability due to the curved backrest and it is highly adjustable. There is an LCD-display on which you can change between 3 different speed modes in order to limit max speed while in certain areas where high speed might not be necessary. The LCD-display also shows speed, distance traveled and battery power. The stability which is often an issue when it comes to 3-wheel scooters has been effectively handled by adding the option to either increase or decrease the space between the rear wheels in order to minimize turning radius or to maximize stability. Those who buy the pride Victory 10 are looking for a scooter suitable for people above 300lbs. They want a comfortable ride that does well on uneven surfaces like gravel and grass thanks to its double suspension system. Pride Mobility recently announced the Victory 10 LX CTS mobility scooter with improved comfort, stylish design, and a front + rear suspension system. It provides one of the most comfortable rides you can even imagine and it does well on most surfaces. As always with Pride Mobility you can rest assured that you’ll get swift, accurate and helpful service whenever problems occur. They’ve really thought about the design and that isn’t just the new and edgier look of it. They’ve added courtesy light underneath the tiller, a full LED-light system, and a hidden storage space in the base of the new ergonomic delta tiller. If you weigh around 300-400lbs this is a purchase you’ll never regret. Those who buy the Hummer XL are looking for a scooter that possess these features; reliability, stability and a comfortable, safe ride. If you’re looking for a full-sized medical scooter on 4 wheels with great stability and features? The Tzora Titan Hummer XL is one of the best 4-wheel mobility scooters and it has a great track record. It’s a popular choice, giving you great comfort and stability whilst still being easy to operate. It weighs a bit more than some lightweight options available within our reviews, but it gives you a more sturdy ride and it can take you almost 16 miles on a single charge and it has a top speed of 6.8 mph which is better than most of them. The experience of riding the Hummer-XL is an outstanding one, not only due to the pleasant armrests placed on both sides that can be adjusted and folded away if needed and a highly adjusted chair that is comfortably cushioned. No, it’s because you can ride it any time of the day due to its full light system which gives great visibility at night both for you and those around you. It has a full suspension system which increases its overall performance and provides a bit smoother ride, but nothing too fancy. Just don’t get too comfortable, sitting still for longer periods of time has its backsides. The scooter can be folded into two separate parts which weigh around 60 pounds each and its size makes it fit into most mid-sized car trunks and backseats. Those who buy the Solax Transformer travel scooter are searching for a lightweight and easy to fold scooter in order to accompany them throughout the house. But they also want the option to go for greater distances outdoors if needed, and a scooter that provides easy access that can support them during their travels, whatever their transportation of choice is that day. Up to 3.7 mph and Up To 13.5 Miles Per Charge! The main thing that speaks for the Solax Transformer is that it’s portable and the folding/unfolding process is done automatically with a remote control. The best feature that the transformer possess is that with the push of a button on your electric mobility scooters remote control, it will fold itself into its fully folded state without you having to intervene at all. A fantastic feature for seniors/elderly and those who might not be handy enough to handle the process of folding it together by themselves, or for those who just don’t want to go through the process at all. It is a comfortable ride and the seat is well-cushioned with two adjustable armrests. It is airline approved so you can take it with you on your travels, whether it’s by boat, car or plane. A solid choice for those that want a mobility scooter for indoor use or just want something easy and versatile. Main reasons why buyers love the Go-Go Traveler is that getting around with it is easy. Many buyers have expressed their need for a good mobility scooter to take onto cruise ships in order to enjoy their cruises more. According to their reviews, this scooter is pretty much the best choice for taking with you on cruises due to the fact that on many cruise ships you already have the option to rent the exact same model. But if you’re going on more than 3 cruises a year, you are better off buying one, then renting. The Go-Go traveler elite plus from Pride Mobility comes in two options, 3 or 4 wheels. It’s like with any 3 vs 4-wheel scooter the need for good turning radius versus the need for stability. It is much appreciated amongst its users and we cannot do much more than to agree that it is a nice scooter. But it does have its throwbacks like riding on gravel, for example, that can be unpleasantly uncomfortable and it won’t work at all if the gravel isn’t packed well. The scooter is to good use during airplane travels, on cruise ships, going around the neighborhood or making a small grocery run. The quality is outstanding and you can rest assure that you will be very well taken care of in case any problems arise, thanks to their warranty. Those who buy the Scout are mainly looking at the price and in this particular scooter, there is nothing wrong with doing that. It provides the user with good and comfortable transportation at a reasonable price. This best-selling mobility scooter, Scout from Drive Medical, a great choice for those who are looking for a bargain. It provides everything you need in moderation. The Scout might not be a top of the line scooter, but according to its users, it’s money well spent and we have to agree with doing some testing. For a price just above 600$, you get good comfort with a swivel seat which makes getting on and off a lot easier. Both the chair and the armrests are adjustable in height and they can be tucked away if needed. For a few hundred bucks you have the option to upgrade the battery pack in order to get a max distance of 15 miles, up from the initial 9 miles. The ergonomic throttle control is mounted upon a delta tiller which makes it easy to maneuver even for people with low arm strength & dexterity. You’ll get good storage space with the plastic carry basket that is included for free and most accessories you can buy for these mobility scooters fit just as good on the Drive Medical Scout as it does on any other scooter. It can be folded into two pieces that can fit in medium-sized car trunks with ease. A fantastic purchase for those who need a cheap, basic scooter for daily use. People going for the Go Go Ultra X need a small and compact transportation option, backed up by a reliable product and great service. Many like using it indoors due to its small size and the 3-wheel option give it a very convenient turning radius. Includes Vidacura's exclusive 5 year Extended Warr. even on the batteries. Largest piece weighs just 28 lbs. 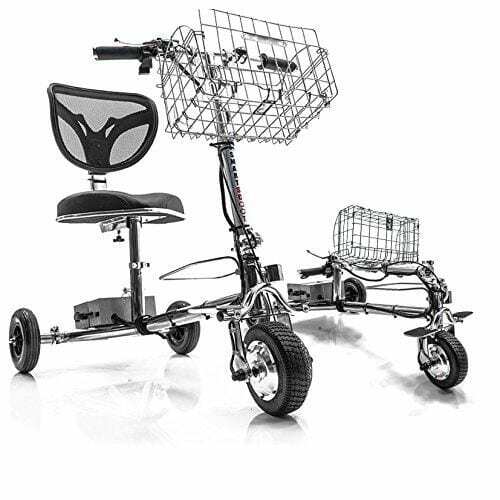 The Ultra X from Pride Mobility is available with both 3 and 4-wheels, depending on your needs you can choose the appropriate setup for you. It works fine outdoors but it’s indoors it really do shine. With it’s small turning radius you can easily get around both at home and in the supermarket. It does only take a load of 260lbs and we feel that it best fits those looking for a small and compact scooter. If you have a small car or need some help getting around the house then the Ultra X is a great choice for you. If you’re around 400-500lbs the Pride Maxima is a great choice. People who pick the Maxima need a means of transportation that can provide them with great comfort and features even though they weigh above the standard 300lbs limit of most smaller scooters. For those above the small mobility scooters standard 300lbs weight limit the Pride Maxima is a great choice. However, we recommend it first and foremost to those touching the 400lbs+ limit due to the fact that the Victory 10 CTS can handle up to 400lbs and is a much lighter option to the Maxima. None the less, the Maxima provide great comfort and a very spacious seating that is more than generous. You get a lot of room for your feet to move around on and it is very easily accessible. Something we love with this scooter is its long range which can take you up to 16 miles on a single charge. If you’re in the need for speed the EW-36 is the choice for you. Customers going for it are those looking for a fast scooter that can go for great distances without the need for them to charge it. They want to use their scooter outdoors, but be able to take it grocery shopping. The EW-36 mobility scooter with ELECTRONIC BRAKES is a high-power mobility scooter using a transaxle brushless electric motor. At full power the EW-36 can reach speed up to 18 mph which makes it easily the fastest mobility scooter on the market! Up to 45 mile range per single charge! Also included a reverse switch, armrest and large storage basket. The EW-36 comes equipped with a digital anti-theft alarm and two rear shock absorbers on the frame. .
E-wheels have definitely done a great job when it comes to structure and design. With the high speed and long distance, the EW-36 give its users the ability to go wherever they like. The top speed, however, can be adjusted when used indoors, so you do not have to worry about slamming into the grocery disk while shopping. For bigger shopping sprees a carrier can be purchased and attached to the rear, this adds to its already generous loading capabilities. Great headlights provide perfect visibility during all times and the twist throttle gives it a more sporty feeling. It’s slick and cool design is similar to a moped, but with 3-wheels and it comes in a bunch of different colors. Given the cool-factor of this one, the built-in anti-theft alarm might come in handy. Wanna go hiking? Previous customers for the Vita Monster are raving about all its great features and there are many. This one is for those who doesn’t get stopped by a little dirt. Many previous customers have been riding ATV’s and state that this scooter provides the same feeling but with higher comfort. Perhaps you live in the countryside where smooth roads aren’t an everyday sight. Then the Vita Monster is a great option for you. When your friends go hiking, or for a dirt run on their ATV. Don’t just sit there, tag along! It does come at a price, and it’s a pretty high one too. But for the stability, comfort, and feature rich scooter you get, well, that’s the price you have to pay for a really robust and fun mobility scooter. It has both front and rear independent suspension, high ground clearance, and a powerful 900-watt motor giving you the option to ride on even the most unforgiving of terrains. It can accompany you anywhere, and the only concerns we have are that the tires wear down a bit faster than expected. It has a stated 28 miles per charge distance, but depending on load and work terrain you are mostly looking at something between 15-20 mile at best. Below we will explain the importance of doing your homework before buying a medical scooter in 2017, the era of technology. There are some things that are of utmost importance when you’re on the hunt for a new electric scooter. Taking your time to at least get a small grasp at what these type of mobility vehicles can assist you with is a must. Go through the topics below that are relevant to you and your needs in order to see the bigger picture when it comes to buying one that fits you personally. For people with limited mobility, a medical scooter can aid them in their day to day life. Whatever is holding you back, whether it be age, mental or physical capabilities a power scooter will help you regain that independence. With the help of a medical scooter, you can perform those everyday tasks again; like shopping, visiting friends, running errands or just moving around the house. However, if your mobility is greatly limited an electrical wheelchair might be a much better choice for you. These provide better seating, safety, and stability for people with limited strength in their legs and arms. If you think this might be what you’re looking for then you should head over to our electric wheelchair section to find which one would suit your needs best. When choosing a medical mobility scooter there are some key futures to look for depending on what your needs are these might differ. Some of these key futures are battery life, maximum speed, weight capacity and operating range. So make sure that the scooter you are interested in possesses these key futures that fit in best with your reality. If you want to travel longer distances you might focus more on speed and battery life/distance per charge. If you are to move around at home the scooters maneuverability and turning radius might be of more importance. The scooters we have reviewed are all available for purchase in online stores with delivery to your door-step. There are an ocean of different brands and models to choose from, but we’ve focused on the newer models which will last longer, have spare parts available if trouble comes along the way and possess the newest technology. Most scooters that we’ve tested are intended for use on flat surfaces or indoors. Due to the fact, some of these scooters have low ground clearance running on uneven terrain may cause them to get stuck, so keep that in mind. The price of electric medical scooters differs a lot and at the time of our review, they ranged from $600 all the way up to $10,000. What are im going to use the scooter for? Depending on your answer you might want to check out the foldability of the scooters, how sturdy it is, that the battery is airlines approved and perhaps the weight in order to easily be able to load it the back of your car. What type of terrain do I need to be able to ride be riding on? There are scooters that looks and even works similar to an ATV which allows you to pretty much go anywhere. But for most of us, it’s more about gravel, pavement or lawn. So making sure the one you’re looking at does have the right assets for the job is crucial. When people start to look at things they want to buy they rarely set a budget in beforehand. It’s important for you to know what price range you want to be looking, otherwise, you’ll soon feel overwhelmed. Figure out how much being able to get around quickly and freely again is worth to you, then check what floats your boat in that price range. At first, it might sound a bit strange to hear there is a need for off-road mobility scooters. But after all, these vehicles are built to assist you in your daily life. Perhaps you’ve lived an active outdoorsy life before, riding ATVs, going for hikes up the mountain track. Well, if hiking up that mountain is what brings you joy and happiness in life. Being able to do the things you love, once more. That is the purpose of mobility scooters. So we’ve crammed together a list of the best off-road options for you. For heavy people, the most common scooters might not be a good option due to the industry standard 300lbs weight limit. These people need more stability, a wider seat to sit in comfortably, and perhaps stronger motors and battery. For those of us who weigh in at or above the 300lbs weight limit of the most standard mobility scooters, we might have to look elsewhere. For those, we’ve put together a list of reviews for the best performing heavy-duty mobility/medical scooters in the industry. These have enough power, stability, and weight limit to fit everyone’s needs. No matter weight. So if you’re a sturdy person you should definitely check these scooters out. If you are looking for a good mobility scooter for seniors then there are a few key point to think about. You can find a few good choices within our top comparison list that would do very good as an elderly scooter. But to make things easy for you, we’ve made an entire article focused on guiding you in the right direction and to help you sort out these key features that could make life much easier for you, or the senior whom you intend to buy the scooter for. You can find the guide to buying an elderly/senior-friendly mobility scooter here. The main reason you’d want to go with a 4-wheel is the fact that you are looking for stability. These often come with swivel seat and the increased stability from its 4 wheels will definitely help you out getting on and off without you risking tipping over. Something to consider when choosing a 4 wheeler is that you will lose turning radius and you might have problems turning in tight and narrow spaces. The main reason for getting a 3-wheel is due to its tight turning radius, they are often also more compact when folded together. So if you plan on going through narrow places, or if your home isn’t as spacious. Well, then you should definitely consider getting a scooter with 3 wheels which will help you turn on a dime. Something to consider is that while you get a better turning radius on 3 wheels, you will lose some stability. Overloading a front/rear basket might be a bad idea on a 3 wheeler due to the fact that if you are turning at high speed, it could possibly result in tipping over. When we evaluate each mobility scooters performance the first thing we look at is its maximum speed, weight capacity, and operating range. These are the main things that affect a power scooters usability and overall performance. Other things that are of utmost importance are a scooters maneuverability, the comfort of the rider, its ability to climb inclines and its ground clearance. Something also taken into account is if it has both 3 and 4 wheel options, what type of wheels are used and how the folding mechanism works. During our evaluation, we found that even though some might not be good at a certain task or surface, they might perform well under other circumstances. That’s it for our reviews & guide on finding the best mobility scooter. Whether your reason for getting one is because of a handicap, if you’re disabled in any other way or due to overweight; you are sure to find the best suitable scooter for you within our reviews. If you have any questions related to electric mobility scooters you can leave them below and we’ll get them answered as soon as possible.